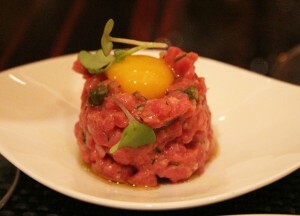 Steak Tartare from BLT Steak at The W Downtown. Downtown Atlanta Restaurant Week 2014 is back again in full foodie force from Aug. 9 – 17. Now in its 12th year, there are more than 30 participating restaurants offering prix-fixe menus ranging from $15,$25 or $35 for brunch, lunch and/or dinner options. Prices are per person and exclude alcohol, tax and gratuity. Click here to see a list of participating restaurants, keep up with your fellow Atlanta foodies using #DARW2014 and check out our mouth-watering photos from our tasting at BLT Steak! That Steak Tartare looks good! I can’t wait to hear reviews on the restaurants!